A subject that does not receive any publicity of note but plagues us all unless you live alone, it is the subject of hiding the Xmas presents from loved ones. Now disregarding Lottery winners and footballers, the majority of people living in the UK occupy a modest compact living space and as such every square inch of the space is both occupied and visited on a frequent basis. Traditionally, you would be thinking well in advance of Xmas what you would like to buy your loved ones, as for the kids that is usually a no brainer as they will have been pleading for weeks about the latest must have plastic Chinese import, as seen on TV or at a friend’s house. So there you are armed with your list at the next hurdle you encounter is how too surreptitiously sneak away to buy them undetected. Again traditional life means we all have routines that we loop through daily, consequently any noted deviation to this routine stands out and arises suspicion or worse, questions. So purchases are made in plain sight days and sometimes even weeks ahead. You may wonder about using the internet but alas that raises as many problems as it solves. Sure you can happily click away and purchase to your heart’s content with absolute certainty of not being discovered, it is easy. However can you be as sure about being the one to receive the parcel from Mr Courier or Mr Posty? And let us not forget about the wonders of delivery dates being accurate, especially around the Xmas rush, Wednesday morning as often as not will turn into a Friday afternoon arrival. However the obstacles you have over come so far are nought to the next one. What to buy, where to buy and how to get away with it are all common problems and can be discussed with friends and work colleagues in a general forum so the acquisition of tips and tricks is natural and inevitable. That said, no one really knows your house like you do, its potential hiding spaces, the routines and who goes where and what for or able to judge the associated risk of a present being discovered. So here we are, present under arm, a slightly heightened sense of urgency causing an increase in heart rate and adrenaline levels, you need to act fast. We have all been that soldier, we all have the T shirt and we are all still usually clueless as to a solution and I for one have had enough. I think it’s time we pooled our ideas for solutions to this situation. What have you done in the past to survive this horror scene, do you in fact have a well oiled idea that just flows easily and extinguishes the worry of discovery? Then share…please! So to start the thread, here is my strategy that has worked for me in the past. Wrap the presents in alternative packaging and simply place it under the tree. Simple but very effective and it also teaches kids and other family members (points at Mark) to be patient. For example next time you empty a jar of coffee, don’t through it away just pop it in a cupboard. Ideal for hiding a small present in and even of any caressing of the package is only going to raise a quizzical frown as the present hunter tries to work out why on earth you have bought them a jar of coffee for Xmas, what a wonderful YouTube clip it would make. I collect boxes and then over package most of the gifts to change their shape. This way my prezzies can be left out there in the open and it is unlikely that their true identity will be revealed before its desired time. What is your strategy for hiding gifts? This post is an entry into the Hudl Christmas cheer competition. HAHA! this seems like fun..Im too lazy to even wrap my gifts! Great ideas! I re-use random containers, like coffee cans, for my presents too! I always used to do this to my parents – great post! merry christmas! 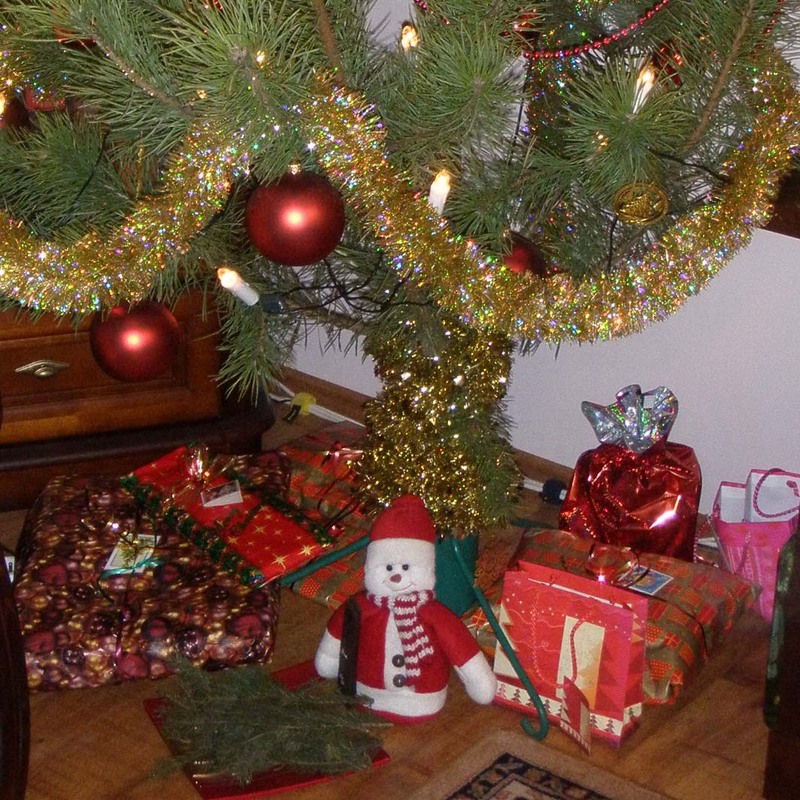 im excited to open my gifts under the tree! Haha ! That’s one good idea to hide all the Christmas Gifts!! Merry Christmas 🙂 Happy holidays !! mmm that’s right it’s not simple, but if you put many packages at the same time under the tree yo would be fine :D.
One year when we were kids, I heard a noise upstairs. Mum and I walked up quietly to find my brother in her bedroom. He had found, unwrapped and taken out of the box, his brand new Optimus Prime and Megatron. Deep in a fight to the death he didn’t hear us creep in. Looking back it was hysterical! Cheeky! I am the one who has trouble waiting, well I have gotten much better, I just love giving people their presents, so I say ‘open that one now’ or ‘go on you know you want to!’ Hubby doesn’t even get his wrapped before he is giving my presents to me! We don’t really have this problem. Daddy isn’t a snoop so mummy can easily hide them in a cupboard she knows he never looks in. Daddy isn’t a good hider so mummy has to resist the urge to snoop, as she’s accidentally found some of her presents in the past. But the delivery is an issue. Usually she has things sent to her work address but the other day she forgot and daddy opened the door to the courier…whoops!